Absi Economy Trophies are designed especially for events with tight budget. Yet they are all carefully designed and produced to supply you with aesthetic trophy, elegant style and modern look. Personalized by your message, they will carry your appreciation, and capture the attention of the beholder. 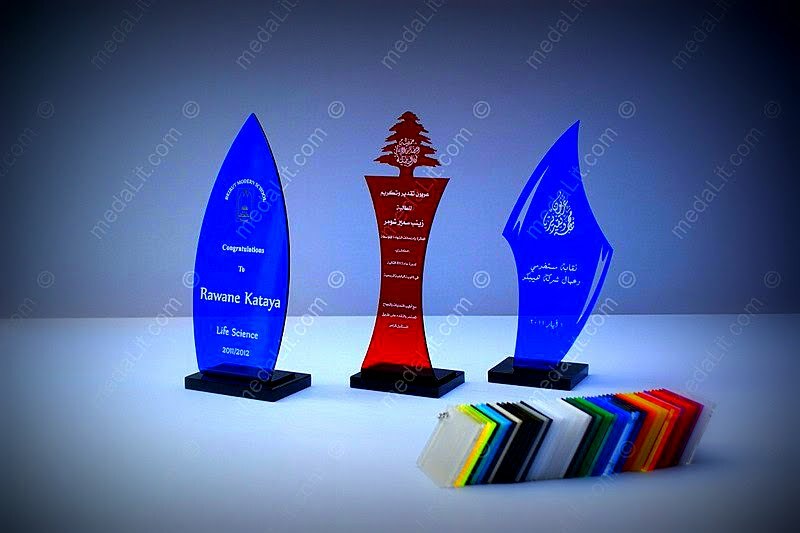 The "Absi Economy" trophies are made from acrylic sheets 3 mm in thickness; in addition to the standard crystal clear, a wide selection of colours are available. Any text and drawing can be laser engraved on the body. Engraved areas appear milky white on crystal clear surfaces. You can get an idea of what you may want to say in your award by viewing different photos in our gallery. You can also read our Personalizing Your Award Guidelines. Review our Artwork Submission Guidelines to make sure that your graphics file is compatible with our engraving requirements. You can order any model with a medal to enhance the overall appearance of the trophy. View a video about different types of acrylic trophies. Any text and drawing can be laser engraved on the body. Engraved areas appear milky white on crystal clear surfaces. Alternatively, engraved areas can be color filled. Every ordered trophy can carry a unique message and name. Available in 3 sizes A, B and C (See table). Packed in a plastic bag as a standard. Several models are available, each model is available in 3 different sizes: A, B & C.